Popular actress Anushka Sharma has finally decided to become the better half of her long time boyfriend, Indian cricket team captain Virat Kohli. On December 2017, both tie the knot in the presence of their families and close friends in Milan, Italy. The couple themselves took to twitter to confirm their wedding and shared few pictures. They wrote, “Today we have promised each other to be bound in love for ever. We are truly blessed to share the news with you. This beautiful day will be made more special with the love and support of our family of fans & well wishers. Thank you for being such an important part of our journey”. The news has left everyone surprised and happy at the same. Although the rumors were in the air from last few weeks but nobody thought that they could be true. Fans as well as Bollywood & Cricket stars, all have loaded the social media with best wishes to the newly-wed couple. Reportedly, the couple will be hosting a reception on 21 Dec. 2017 in New Delhi for their relatives and on 26 Dec. 2017 in Mumbai for friends and colleagues. 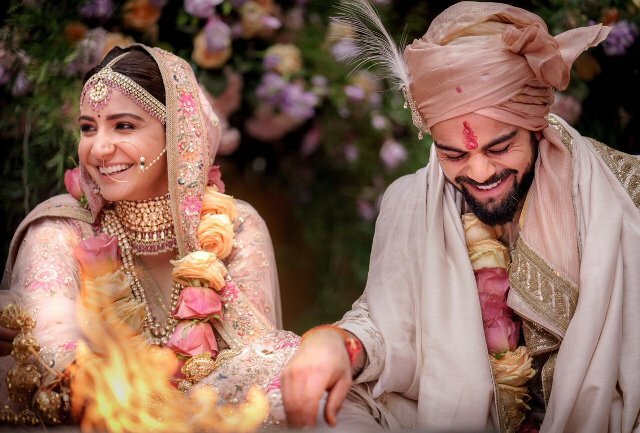 Afterward they will travel to South Africa where Virat will start prepping for the upcoming series and Anushka will spend New Year’s Eve with him. In the first week of January 2018, Anushka will return to Mumbai to begin the next schedule of Aanand L. Rai’s dwarf film with superstar Shahrukh Khan. She will also start prepping for her next titled Sui Dhaaga with Varun Dhawan. Meanwhile she will also be busy in promoting her upcoming film Pari, slated to release on 9 Feb. 2018.